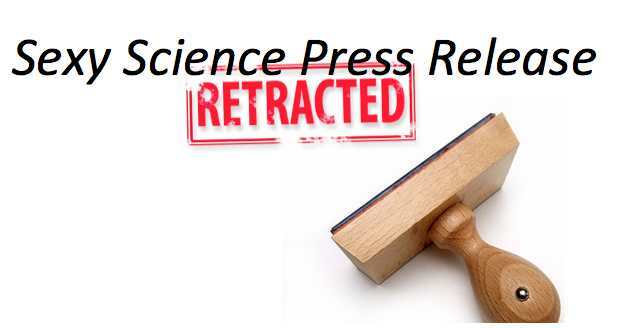 Science press releases behaving badly: time to start tracking their retractions? Over at RetractionWatch, their team does a great job following retractions of science papers. Sadly, the number of published manuscript retractions gives them more than enough material to post several times a day. There’s another phenomenon going on that I think might warrant their increased attention: the possibly rising number of retractions or corrections of science press releases (PR). Gary Schwitzer, over at Health News Review, is reviewing science PRs, which is really interesting reading. I highly recommend that you check it out. While recent data suggest that science pubs themselves are increasingly written with intense, positive words that might tend to hype things, PRs on science papers can be darn right flamboyant and often get the science wrong. A good example is the squeeze stem cell PR paper flap that I blogged about yesterday. That PR was an example of a PR running far amok, but it is far from being alone. Just how often do PRs on science papers get things so bad or cause such a fuss that they are pulled (aka retracted)? I don’t see any data out there, but it’s got to be fairly often. I’ve seen it happen numerous times over the last few years. Should somebody be tracking retractions of science PRs? It might be interesting to follow such PR retractions and collect data on whether they relate to particular fields, whether particular institutions are overrepresented in the PR hype, and if there is an increasing number of science PR retractions. What do you folks over at RetractionWatch think? I note that they have posted relatively often on press releases. Of course, one problem with this idea is that PR retractions don’t get published. Another difficult issue is that institutions going off the deep end with their PRs often do not retract or correct the PRs even if they are bad. What do you think of science PRs behaving badly? How often is it the PR writer versus the scientists that they are quoting who are engaging in hype? Both? Does scarce funding play a role in this? Will Lawsuit Against PubPeer Chill Post-Pub Review? A nice commentary (here: http://www.bmj.com/content/349/bmj.g7465.full?ijkey=pdGfXk42ClHVR4e&keytype=ref) by Ben Goldacre, who also runs the site http://www.badscience.net/. His is an interesting point: give the final word to the scientists and hold them accountable for PR “mistakes”. As you mentioned though, I believe funding pressures and point of blame will keep many academic researchers from reviewing these extravagant press releases before they go public. We live in a world of mostly nonsense and a little bit of sense. The whole idea of science was to enable everyone to tell the difference. But then science got too damned difficult for most people to deal with, so, here we are, right back at the beginning. In the physical universe it seems that matter is more common than anti-matter. I suspect that a similar asymmetry applies to “knowledge”. The set of “knowledge” is large and growing. The set of “anti-knowledge” is larger and growing faster. Eventually “anti-knowledge” will swamp “knowledge”. Science itself, will be saturated! Sadly, there are several debunkers of political misstatements, Alas, the politicians and public don’t seem to care. There are — or were — several good podcasts devoted to debunking bad science but not press releases per se. A myth busters-like approach might work. Singal nails it when says that “journalists will read a press release but not the study.” Regardless, It’s the rare journalist who can give effective peer-review, and so before writing anything, it’s always prudent to find at least one (and preferably two) experts in the field who have no affiliation to the press release to review and comment — both on the release and the study. This practice would help identify problematic releases.